Ever wished you and your partner were the only people in the world? Here is the chance to experience such a feeling on our sandbank picnic. There is only you, surrounded by the sapphire sky and the emerald waters with your loved ones on powdery sand. You could only hear the sound of waves and the sound of beautiful birds. There are several sandbanks just few minutes away from Dharavandhoo including ‘Angafaru Finolhu’, ‘Maafaru Finolhu’, ‘Huraafaru Finolhu’, ‘Dhoogandu Finolhu’ and many others. “Finolhu” in local language means sandbank. Our guest house will provide speedboat transfer to the sandbank. 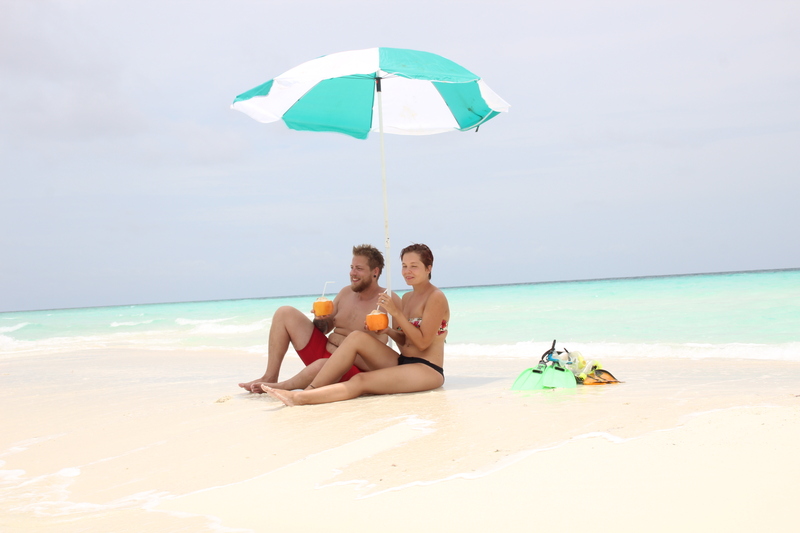 Guests can wear bikini while on the sandbank, and enjoy the natural beauty of the sandbank with white sandy beaches and surrounding lagoons. If you would like to fully enjoy the natural sun, sand and sea, this is another most ideal excursion to do. Our guest house will provide lunch as part of the excursion package. Guests can request for a fish barbecue in the sandbank. In addition, we provide Romantic Sunset Dinner at Sandbank.